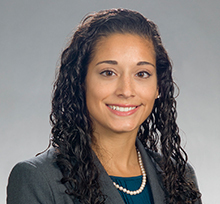 Tia Chatterjee Wallach has experience representing financial institutions, borrowers and agents in a broad range of corporate finance and restructuring transactions, including first lien, multi-lender syndicated loans, bridge loans, term and revolving credit facilities, and asset securitization. She also has experience representing real estate investors on the acquisition and financing of commercial real estate properties and other general corporate matters. Represented Hologic, Inc. in connection with its $3 billion senior secured credit facility and over $1 billion in high yield bond issuances. Represented Hologic, Inc. in connection with $200 million receivables securitization facility. Counsel to first lien lenders in connection with $600 million senior secured exit credit facility to Millennium Health, LLC. Counsel American Railcar Leasing in $150 million term loan railcar financing. Counsel to Tropicana Entertainment Inc. in $300 million term loan and $15 million letter of credit facility. Represented first lien lenders in connection with $175 million senior secured credit facility to Par Pacific Holdings, Inc. Counsel to noteholders in the issuance and exchange of convertible notes issued by a renewable chemicals and biofuel company. Represented telecommunication company in delayed draw term loan facility. Advised a California healthcare district in debtor-in-possession financing and asset sale in connection with its Chapter 9 bankruptcy proceeding.